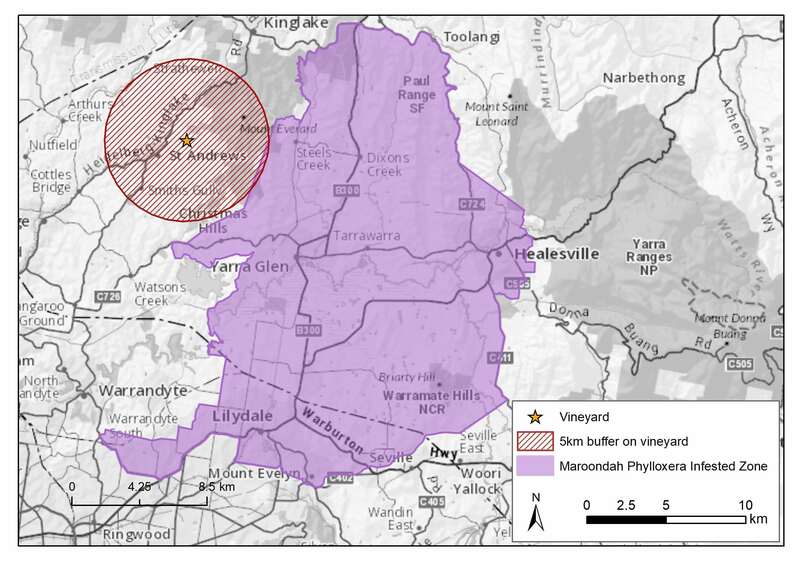 The 5km quarantine area around the infested vineyard abuts the north west boundary of the existing Maroondah PIZ. Click here to see a map. Work is currently underway by Agriculture Victoria regarding the establishment of a PIZ in accordance with the National Phylloxera Management Protocol given this new detection. All operators have an obligation to actively undertake measures to prevent the movement of pests, diseases and weeds, including phylloxera, as part of their shared responsibility for biosecurity. Be aware of Phylloxera Management Zones for where phylloxera is and is not. Review your business links within and between these zones, including the new infested area around St Andrews in Victoria. Grapes and grape-related material (wine, juice, must, marc). Grapevine planting material (cuttings, rootlings, potted vines, germplasm). Diagnostic samples and vineyard soil. Contact your state regulator to discuss any queries you have regarding the movement of these phylloxera vectors. NOTE: If you are moving any of the above items out of the 5km quarantine area at St Andrews, you MUST comply with movement conditions stated in Agriculture Victoria’s Industry Notice. Implement strict farm gate hygiene practices to prevent the entry of phylloxera or other pests, diseases and weeds into your vineyard. This includes asking for and recording the wine regions where all visitors to your site (including their machinery/equipment) have been in the past three weeks, so that you can assess the risk they pose to your vines by determining whether they have been in a PIZ or PRZ. Continue to regularly inspect your vineyards for unusual vine growth symptoms and pests and diseases and seek help to identify the problem. Mandatory reporting of all suspect cases of phylloxera is required to your state regulator or to the Exotic Plant Pest Hotline 1800 084 881. Agriculture Victoria and Wine Yarra Valley are working together to assess and manage the impact of the detection and implications for the existing Maroondah PIZ boundary. Vinehealth Australia and Australian Grape & Wine will continue to monitor the situation and work together to communicate information to industry regarding this detection and to ensure that insights gained can be used to prevent the further spread of phylloxera. From a regulatory perspective in SA, Vinehealth Australia is working closely with Biosecurity SA to evaluate and monitor the risk this detection poses and to ensure strong state Plant Quarantine Standards. Phylloxera is a devastating soft bodied insect pest of grapevines worldwide, affecting Vitis species (commercial grapevines and ornamental vines). There are 83 endemic strains in Australia that are confined to a number of wine regions in parts of Victoria and New South Wales. It represents a major threat to the vast majority of Australia’s vineyards that are planted on own roots, which are highly susceptible to attack by the pest. Phylloxera Exclusion Zones (PEZ) have been surveyed and found free or are declared free historically. Phylloxera Risk Zones (PRZ) are of unknown status. Phylloxera Infested Zones (PIZ) contain vineyards known to be or have been infested. For more information about this new detection, click here for Agriculture Victoria’s Industry Notice.